Self-righteousness can feed upon doctrines, as well as upon good works; and a man may have the heart of a Pharisee, while his head is stored with orthodox notions of the unworthiness of the creature and the riches of free grace. There is a 1.7% insurance rate that is taken at the same time. Companies are taxed at 30%. Sales tax (Goods and Services Tax) is 12.5%. The system is actually more complicated than that with student loans being processed by the tax department, other special tax codes for some jobs, year to year income equalisation schemes for fluctuating income such as farmers may experience, charity donation rebates, child care rebates, family support,.... Sales tax is exempt from financial transactions, residential housing, mining precious metals, charities, and some other situations. The proposal is to keep the tax take the same but alter the structure. Essentially the top tax rate would disappear and sales tax would increase to 15%, though there are other changes concerning property. High tax leads to avoidance behaviour, both legal and illegal. High tax inhibits economic growth. Complex laws leave loopholes which are preferentially exploited by those who can afford accountants and lawyers. Exemptions for certain companies mean they pay less than others who are taxed more, yet they may still use the infrastructure tax pays for. People who earn more money pay more income tax anyway because tax is a percentage rate. Progressive tax favours both spouses working over one spouse earning all the income. Government should spend less and concern itself less in human affairs. In light of these ideas I think the proposals are a step in the right direction. It is a move toward a flat rate for income tax. Further, by having the maximum individual rate close to the company rate decreases the incentive to use creative accounting to minimise tax. Sales tax affects all people similarly. Sales tax can be said to be a tax on consumption (partly true), rather than income tax which is more of a tax on production. This may encourage people to save rather than spend their discretionary money, a good thing. Ideally there would be no tax. If there has to be tax I think the government should slowly divest itself of many of its expenditures and concentrate on core responsibilities, though that is another post. In terms of tax, the maximum rate should be the same as the company rate and be decreased until there is a single rate for all people in all occupations and all companies. An exemption on the first $20,000 income for all would limit the effect of tax on those with low incomes. A rate of about 20% for income tax and sales tax would be a starting point with a plan to decrease both to 10% (or less) over time as economic growth increases tax take and government decreases expenditures. Such a system would be simple, less likely to be abused by both companies and the tax department, and be generally fair with consideration for the poorer members of society. It would led to economic growth and would mean higher employment. With more take home pay the demand for pay rises may decrease in some occupations. Progressive income tax... is the functional equivalent of socialist expropriation. It offers the remarkable advantage of being annually renewable—at least, in the case of those it has not bled dry the previous year. The terms right and left applied to politics can be difficult to interpret. 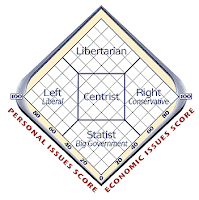 Right tends to mean conservatism and left progressivism, but concerning what? Political or social or economic? People on one wing with regard to social issues may be more likely to be on the same side economically, but there is no reason why someone cannot reside in the other camp. 2 dimensional proposals place economic and state control on orthogonal axes: a totalitarian to libertarian range and a managed-market to free-market range. Of course the dimensions can be expanded resulting in several horizontal axes covering different topics, each with a left and right position. The first suggests the reason for change but the latter is deficient for why things are best unchanged. What is perceived as beneficial about a system that change is not desired? which is a moderately reasonable definition, though right wing may oppose what they consider unjust privilege or favouritism. The right wing article does not provide a helpful definition and suffers from including corporatism and fascism within the grouping. I will leave it to the leftists to comment on whether they fit into this definition, but I favour all 4 right wing positions, though what I accept as rights are limited and negative rights. Labels can be useful, but if they hinder, it is better just to debate the pros and cons of a specific issue. In verse 7, Paul quotes Genesis 21:12 to explain that, even before Isaac was born, God had determined that Abraham’s offspring would be “reckoned” through Isaac—in other words, that the covenant people would pass through the line of Isaac rather than that of Ishmael. The original context of this passage, incidentally, makes it clear not only that Isaac is to be chosen, but that Ishmael is to be rejected in favor of Isaac. Yet God makes it clear that Ishmael is to be rejected by Abraham, so that the covenant line is clearly through Isaac; nevertheless, He reassures Abraham in the very next verse (Gen. 21:13) that “I will make the son of the maidservant into a nation also, because he is your offspring.” In the following verses we read that “God heard the boy [Ishmael] crying …. ‘I will make him into a great nation’ …. God was with the boy as he grew up” (Gen. 21:17-18, 20). In other words, God has a positive plan for Ishmael and his descendants as well as for Isaac and his descendants; it is only as a member of the covenant nation that Ishmael is rejected. There are very few of us who are not in the pay of someone, and no one is entirely reputable. C. S. Lewis. The Lion, the Witch and the Wardrobe. Atheists just as ethical as churchgoers? 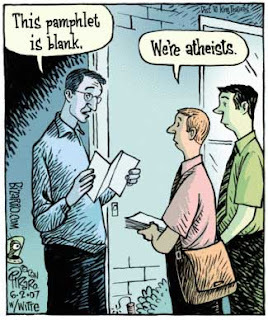 The telegraph recently had an article about the morality of atheists. Atheists are just as ethical and have as strong a moral compass as churchgoers, new research shows. There is no source, as seems increasingly common these days. Newspaper articles appear link to their sources less than bloggers. I think the study may be "The origins of religion : evolved adaptation or by-product?" (doi:10.1016/j.tics.2009.12.007). But people who did not have a religious background still appeared to have intuitive judgments of right and wrong in common with believers, according to the findings, published in the journal Trends in Cognitive Sciences. If I am correct about the source article, this may be in reference to this moral evaluator which the article links to. This looks at difficult, artificial, unlikely moral dilemmas, what to do when faced with competing loss of life, and the issue of double effect. It does not ask which type of behaviours are right or wrong. Of course knowledge of right behaviour does not equate to practice of right behaviour. But is this information surprising? Christianity teaches all men know about God's requirements. The research suggests that intuitive judgments of right and wrong seem to operate independently of explicit religious commitments. While one would hope that Christians exhibit better moral praxis than atheists, Christianity does not require or specify that atheists only perform immoral actions. What Christianity argues is that atheism as a philosophy offers no reason for morality to exist at all. It is not primarily whether atheism makes people eumoral or immoral—though that is also a point, one I do not think the study adequately addresses—rather it is that atheism logically implies that all actions are amoral. There is no ought, only preferences.